I've now got WAY better shifting. The entire install took me all of 30 minutes. Including the time to jack up the car, take pictures, and put it back down on the ground. Without further ado, here come the pics with instructions and notes. 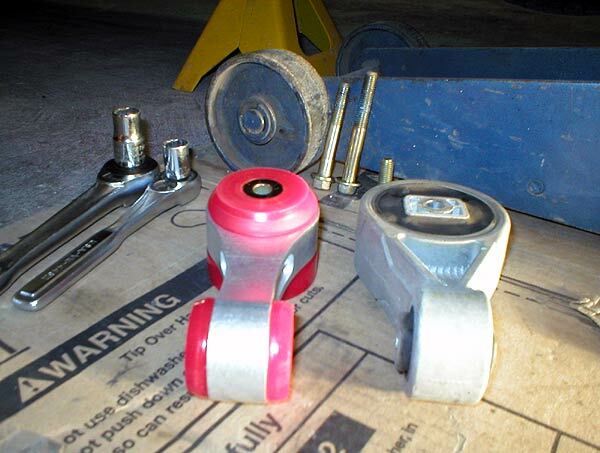 please refer to Frogman283's revised instructions for the bolts and plate noted in step (3). Click Here for the MTX-75 procedure, found near the end of this write-up. Last edited by WD40; 10-20-2004 at 01:39 PM. 1) Jack up the front end of the car, and support on stands. 2) Place floor jack underneath the transmission. As seen in the picture, I used a piece of 2X4 to distribute the load more evenly. Just take the pressure off the mount. No need to raise the transmission. 3) Remove the 3 bolts noted by the red arrows. 4) Loosen the bolt denoted by the yellow arrow, but do not remove. Last edited by WD40; 09-27-2004 at 02:23 PM. 5) Pivot the gold colored plate as shown. 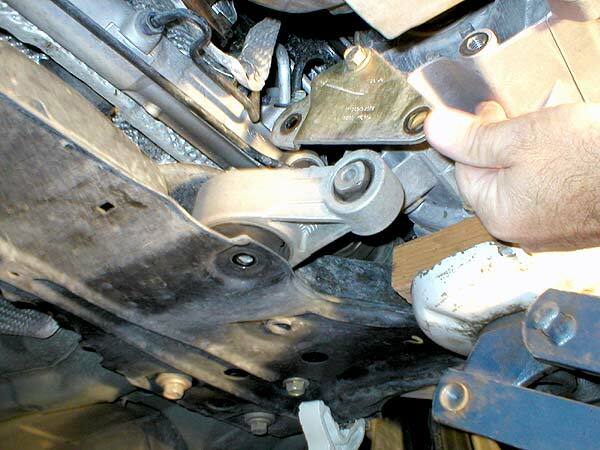 6) Rotate the front of the mount towards the passenger side, pull forward, and remove. Here’s the comparison of the stock and VF Engineering mount. 7) Install the new motor mount just as you took the old one out by rotating it into position. gently pry the engine/transmission assembly forward to line up the rear motor mount bolt hole. 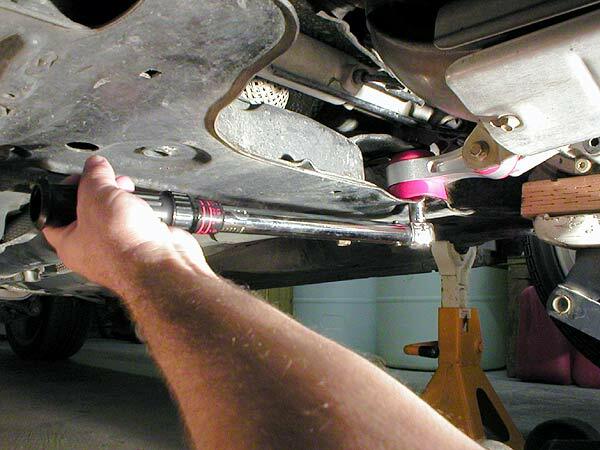 Using a ratchet and socket, snug up the bolt, but don’t torque all the way tight. 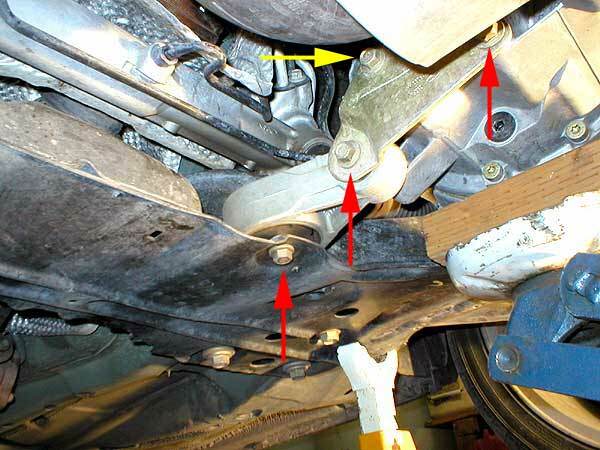 12) Torque the 2 motor mount bolts and 2 plate bolts to 35 lbs-ft.
13) Lower the jack from underneath the transmission, and then lower the car to the ground. 16) Shift from 1st to 2nd gear, and note how much better it hooks up! I am extremely pleased with this modification. You will not believe how much tighter the shifting is. 1st to 2nd upshift is virtually seemless now. No more…..BANG. A pleasant side effect is that downshifting is also notably tighter. It sure showed up this weekend on the AutoCross course. As far as NVH, what I do notice is slightly more vibration just after the engine kicks over upon startup. More importantly, is I don't notice any increased vibrations at idle, I.E. sitting at stoplights. Now, to go get myself the Steeda short shifter, and have the best of both worlds. 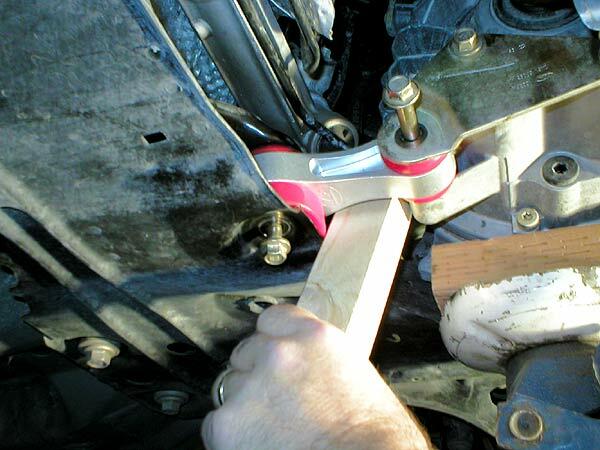 IMHO, I would not install the shifter without first doing the rear motor mount. No matter how much you improve the shifter, the engine is still going to be moving too much. felixthecat and TomPocono like this. Last edited by WD40; 09-28-2004 at 01:43 PM. Nice write up and detailed pics. So, this would also fit on a standard Zetec/Non-SVTF right? Same part number for all models.